I SHOULD be writing about editing, and offering to edit CVs, and to write press releases, and to help you with your business books, but... later, later. For now, I want to talk about the toasty-warm wonderfulness of woodstoves. We got a wood-burning stove last year. I wanted to have a backup for the gas central heating, but it looks as if it's going to be a total replacement, as the price of gas goes higher and higher. Twenty years ago when we moved in, we changed from a back boiler heating the radiators to a gas system, as it was the cheapest and best value. Now that's changed. How that's changed. So, stoves. I was nervous - how on earth do you choose a stove? There's new technology that means modern stoves are waaay more efficient than the old-fashioned kind. Airwash. Secondary burning. A stove heats a million times more efficiently than a fire. With an open fire, you're basically heating (and polluting) the open sky. But with a stove, all the heat comes booming out into the room, heating the whole house. The design of modern stoves burns the fuel, and then burns the smoke that rises off the fuel, lessening pollution by 90 per cent. The heat that comes off a stove is quite incredible when you're used to open fires, or central heating for that matter. The reason for going for these rather than the superb European brands - top-of-the-range Nestor Martin or Morso or J otul or Stovax - is that Irish fireplaces tend to be both narrower and shallower than the European ones. Unless you're rich enough and patient enough to tear out the whole fireplace and rebuild it, you're not going to get one of the European brands. This isn't necessarily a bad thing - though they're fabulous stoves. The Nestor Martin, for instance, can run two pipes off a stove, piping heated air for other rooms. And some of these stoves have soapstone sides or inserts, so they'll act as storage heaters, radiating heat long after the fire is gone. 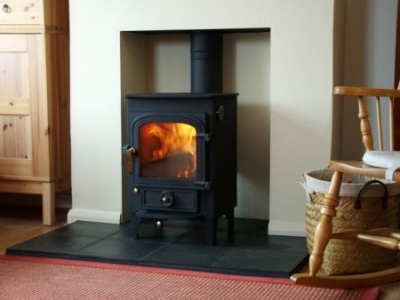 Inset stoves sound as if they wouldn't give off as much heat, but they certainly do; they're toasty. Part of this is the fact that they block off the giant sucking draught that chimneys bring into the room; part is that they just radiate enormous amounts of lovely hot hotness. I wouldn't be without a stove ever again; if I ever can, I'll put one in upstairs as well as downstairs and leave the central heating behind altogether. did a search on the matter and found nearly all folks will consent with your blog. and actual effort to produce a top notch article? but what can I say?